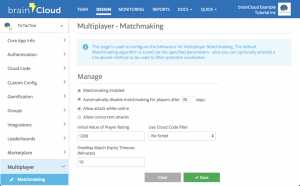 The MatchMaking API is used to find players for multiplayer matches. Once a player has been found using the MatchMaking API, that player can be used for starting a match using either the BrainCloudOneWayMatch API or the BrainCloudAsyncMatch API. For an overview of the different types of multiplayer matches please refer to the Multiplayer documentation. Your player should now be considered for matches. There are a number of factors which affect player eligibility for MatchMaking. 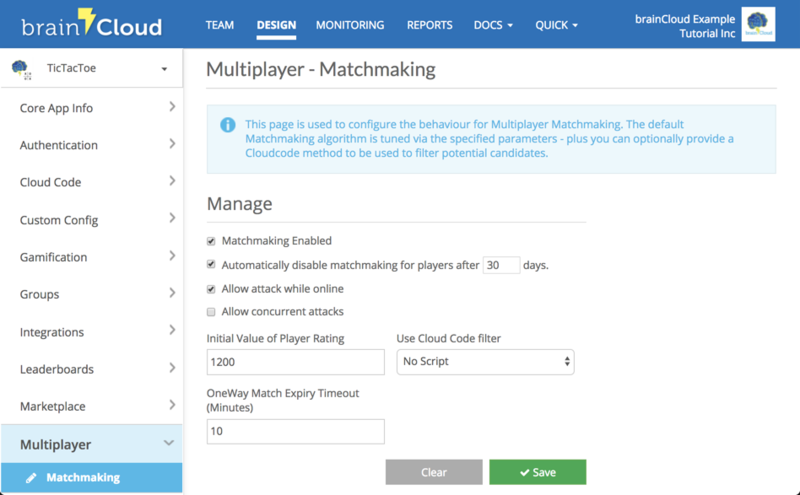 If a player has a current session with brainCloud, they are by default ineligible for a match. This behaviour can be modified by setting the “Allow attack while online” flag to true in the portal MatchMaking section. Note that while developing/debugging, it may be useful to set this flag to true – especially when using the API explorer to test the functionality. Otherwise, players who have a current session will be ignored for MatchMaking. Players will have to explicitly log out from brainCloud to be eligible for matches, or wait for their session to timeout (default is 20 minutes – configurable in the portal). All players in the system have a rating. The initial value can be specified in the portal MatchMaking section. The player rating can also be affected through the MatchMaking API functions IncrementPlayerRating and DecrementPlayerRating. When a request is made through MatchMaking to GetOneWayPlayers, a “rangeDelta” parameter is supplied which limits the range of player ratings that are eligible, in relation to the currently authenticated player’s rating. If player A requests matches with a rangeDelta of 100, only player B will be eligible. You can also request your MatchMaking details by calling the Read API. You can also query the remaining shield time by calling GetShieldExpiry. matchCandidate – The player object. This returns the same JSON as the MatchMaking.Read API call (see below). extraParms – The JSON extraParms object sent in the GetOneWayPlayersFilter API method. This is defined by the API method caller and can be used to help drive the custom filter results. // Now you can use the "otherPlayerSession" to execute API calls as that user. // have certain statistics that match the data in extraParams.